As I have been warned by many people who have visited Edinburgh - yes i LOVED it! and YES I WANT TO LIVE THERE! However before I get too ahead of myself with enthusiasm for the energetically arty town in Scotland, I am reminded of just how cold I was on my journey there. 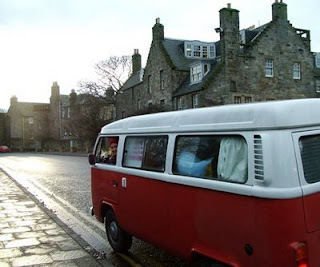 Squashed into a little red combie, called Nutmeg (with no heating in the front) and 4 Aussie girls - we headed as north as we could get in our little bus to explore Scotland for New Year 08/09. We stayed a few nights in Edinburgh and 1 night in Aviemore and a few random nights along the way at service stops where I have NO idea where we were. Edinburgh was every bit the vibrant, energetic creative town an artist would enjoy living. However, the real highlight was the day we left to head north to Inverness. Unfortunately, our lack of heating in the van caused our windscreen to freeze and we were forced to pull over on the side of the road. As fate played it, we ended in the ski resort town of Aviemore. A Quaint, bustling little town where we managed to have a great night of laughs in a few pubs and met some colourful locals. The next morning, cold, tired and hungover - we all witnessed the beauty of the area we were in. 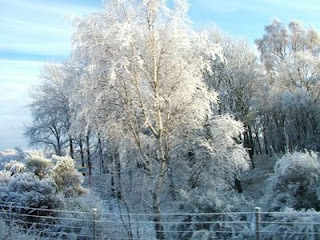 It almost looked like someone had dusted icing sugar around us.